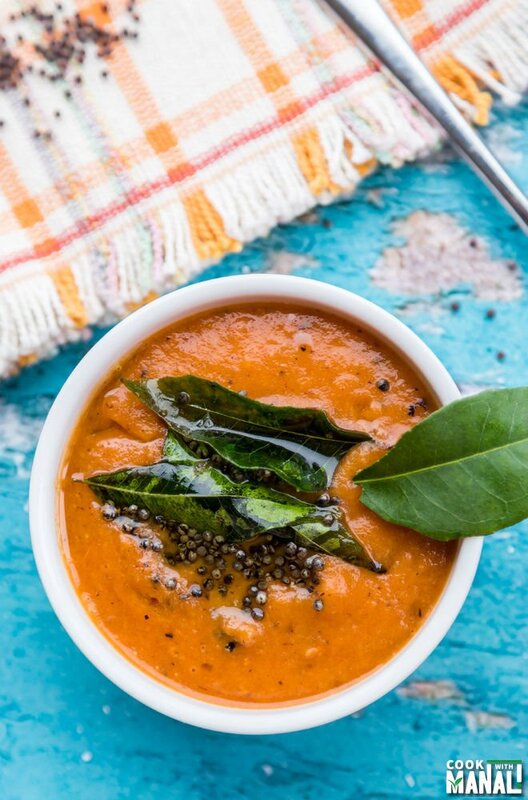 Simple Tomato Chutney is the perfect accompaniment to idli and dosas! 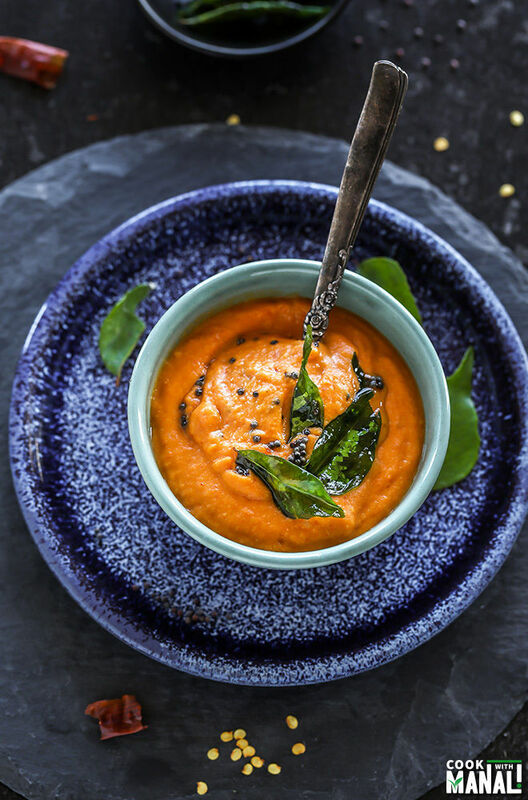 This vegan south Indian tomato chutney is easy to make with basic pantry ingredients. Even though I didn’t grew up eating South Indian food, I love it a lot – like a LOT and we eat it at least once a week. Earlier when we would feel like eating South Indian, we mostly go out as I am was not as comfortable making dosa (rice lentil crepe)/idlis (steamed rice lentil cake) at home as I am in making rotis and parathas. But over time, I have worked hard on my south Indian cooking skills and I can say that I finally made good dosa and idli at home. 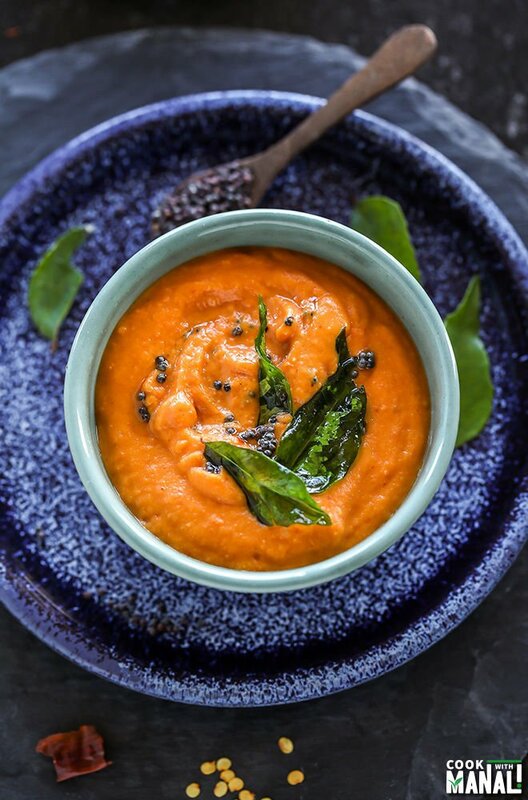 I also love all south Indian style chutneys from simple coconut chutney to this tomato chutney! 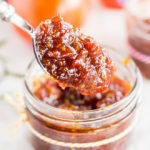 This recipe of tomato chutney is one of my favorites. It’s simple and goes well with so many things! India is a country of spices, achar (pickle) and chutney. There are way too many chutneys and everyone has their own way of making them. I bet you have been to at at least one Indian restaurant named “Chutneys”! We have 3 to 4 Indian restaurants by this name in Seattle alone and I remember there were way too many in London as well. Chutneys always reminds me of my nana ji (grandfather), he would not have his lunch until and unless there was some sort of chutney on the table. Yeah, he was that specific. Mom made a chutney for him everyday with whatever was in season. The most common one was of course the cilantro chutney but then there were also chutneys made with whatever was in season – raw mango, gooseberry etc. 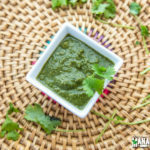 Being an Indian, chutneys are an integral part of my lifestyle and food habits. 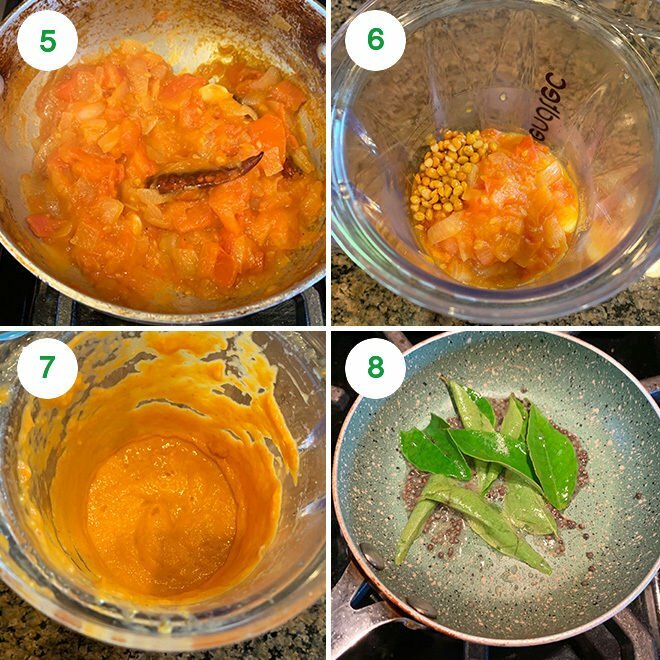 I like experimenting with flavors and come up with different ones like in this peach chutney. But this tomato chutney is as basic as it can get! I have used very less spice here, only 2 dried red chilies. If you love spice, feel free to double or even triple the amount. Me and Sarvesh aren’t huge on spice so I have kept it minimal. The process is super simple- cook the ingredients a little until the raw smell goes away then grind to a paste and that’s about it! A simple tadka (tempering) of curry leaves and mustard seeds in the end is optional but highly recommended. I can’t eat my chutney without a simple tadka but you can skip it. You can also add more flavors to this chutney- like you can add ginger or even roasted peanuts. They will definitely add to the flavors. This recipe is vegan. To make it gluten-free, you may skip the hing (asafoetida) in the tadka. Enjoy this tomato chutney with vada, idli, dosa! 1- Heat 1/2 tablespoon of oil in a kadai/pan on medium heat. Once the oil is hot, add the chana dal and cook for around 2-3 minutes or until the dal is golden in color. Remove the dal from pan and set aside. 2- To the same pan now add garlic, onion and dried red chilies. Increase the amount of red chilies as per your taste. 3- Cook for around 3 minutes until the onions are soft. 4- Then add in the tomatoes and salt and stir. 5- Cook the tomatoes until they are soft and mushy, around 6-7 minutes. 6- Let it cool down a bit and then transfer to a blender along with the roasted chana dal. 7- Grind to a smooth paste. I also added 1/4 teaspoon kashmiri red chili powder while grinding but that’s optional. Transfer chutney to a bowl. 8- To make the tadka/tempering, heat 1 teaspoon oil in a small pan on medium heat. Once the oil is hot, add the mustard seeds and let them pop. Then add the hing and curry leaves. Saute for a minute until the curry leaves turn little crisp. Transfer the tempering to the tomato chutney and mix. Enjoy tomato chutney with dosa/idlis or even parathas. I like this chutney more when it’s chilled so pop it in the refrigerator for 2 to 3 hours before serving. 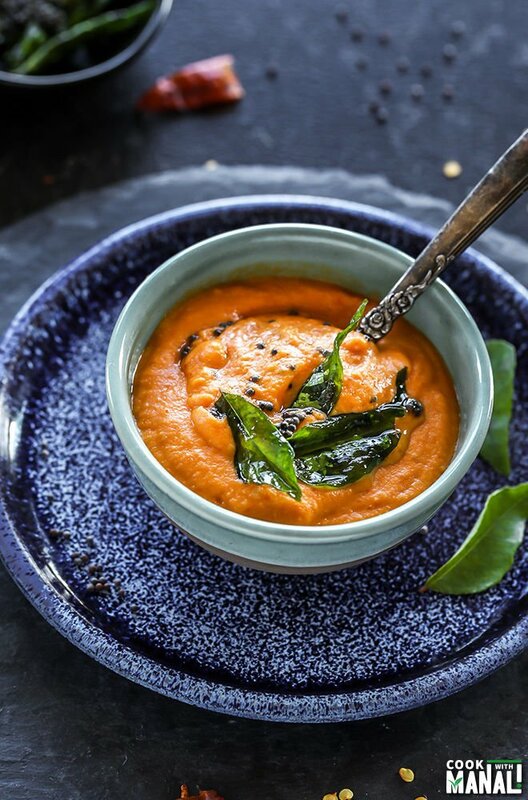 If you’ve tried this Tomato Chutney Recipe then don’t forget to rate the recipe! You can also follow me on Facebook and Instagram to see what’s latest in my kitchen! This post has been updated from the recipe archives, first published in 2015. Heat 1/2 tablespoon of oil in a kadai/pan on medium heat. 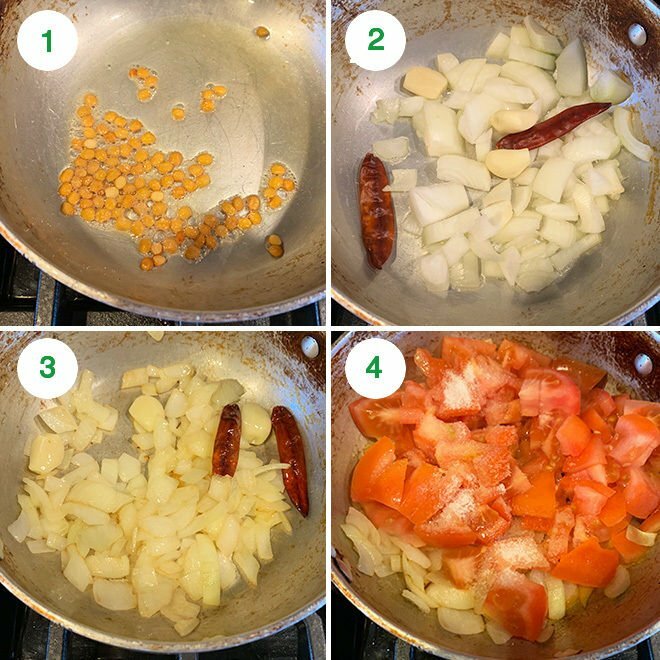 Once the oil is hot, add the chana dal and cook for around 2-3 minutes or until the dal is golden in color. Remove the dal from pan and set aside. To the same pan now add garlic, onion and dried red chilies. Increase the amount of red chilies as per your taste. Cook for around 3 minutes until the onions are soft. Then add in the tomatoes and salt and stir. Cook the tomatoes until they are soft and mushy, around 6-7 minutes. Let it cool down a bit and then transfer to a blender along with the roasted chana dal. Grind to a smooth paste. I also added 1/4 teaspoon kashmiri red chili powder while grinding but that's optional. Transfer chutney to a bowl. To make the tadka/tempering, heat 1 teaspoon oil in a small pan on medium heat. Once the oil is hot, add the mustard seeds and let them pop. Then add the hing and curry leaves. Saute for a minute until the curry leaves turn little crisp. I like this chutney more when it's chilled so pop it in the refrigerator for 2 to 3 hours before serving. If you like spicy food, increase the amount of dried red chilies in the chutney. You may also add roasted peanuts to the chutney. Everything that you post always makes my mouth water, Manali! 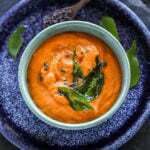 I am a BIG fan of chutney as well and have never had one quite like the delicious recipe you’ve posted here 🙂 I can’t wait to try it!! Pinned! This would be so good with some homemade flatbread dipped in it. Can’t wait to try it! It definitely will be Dannii! You have me hungry for chutney at 9 am! I love all of your recipes, Manali. Can’t wait to try this one! Thank you Jen, hope you give it a try! The flavors of this sound amazing! South Indian food is great! There aren’t too many places that serve it, so I definitely know what you mean. I know…we don’t even have sarvana bhavan here [the famous south Indian chain of restaurants ]… so yeah I gotta learn it myself! Oh my goodness, those leaves just made that dish pop! I love it, thanks for sharing! Wow, that chutney looks amazing !Can’t wait to try it! lovely dish M! Beautiful color. Before long I am going to see dosa, vada and idly recipes here. Just xan’t wait. haha thanks CV…i can’t wait to put it up on my blog too! Feel like polishing it off with idlis!! Yum! I know! thank you Taruna! I love that you expose me to new recipes and dishes that sound and look amazing, but that I’d never think of myself. This is gorgeous! I love coming to your blog… I learn so much about Indian food!! Beautiful photos. Pinned! Thank you Oriana…and it means so much to get photo compliments from you! This chutney looks amazing, Manali! Onion and tomato seem to be the perfect combo. Sounds like such a great spread for just about anything! Pinned! Thank you Gayle, I love this chutney! Do you live in Seattle? I lived in Sammamish for 2 1/2 years. . I wish we could’ve stayed longer. . I loved Seattle. . and probably went to one of those Indian restaurants you mentioned several times! totally agree with you that India is a country of spices and chutneys. Thank goodness for Indian food. . it’s really so delicious!! what kind of dried red chilies do you recommend for this? any kind? Yes I do live in Seattle! 🙂 Aww I wish you were now, we could have met! I love seattle too! 🙂 I recommend the dry red chilies that we get at the Indian grocery store! 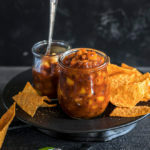 I probably could polish off a whole lot of this delicious chutney Manali – I love aromatic and spicy spreads like this! Manali, this looks amazing! I can totally imagine an appetizer like this making an appearance at my Super Bowl party! Pinned! Thank you for the pin Kristi! This looks perfect for dipping naan into! Yum! It would be definitely good with naan! 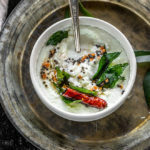 This chutney is my favorite with Idli, can have a bowl full! Great recipe, Manali! Oh my goodness, my mouth is watering over this chutney! I love the onion and tomato flavor combo and the color is so so pretty and vibrant! Thank you Kelly, hope you give it a try! Manali, this looks amazing! Onion and tomato is the perfect combo. Just let me know how to preserve it for longer shelf life. Should I fill it while hot?? ….to store at ambient? Can I pouch it?